Karla’s "GoldStar" is a short film, winner of the Latino Public Broadcasting New Media Grant 2014. 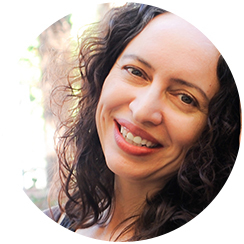 She is company co-producer of AdeRisa Productions, whose feature film "Bruising For Besos" world premieres this summer in 2016. Karla has starred in films such as "Flor De Naranja," "Roses of April," "Betrayed" and "Pura Lengua," which premiered at Sundance in 2005. She is the co-founder and Director of Programming of the Latin@ Queer Arts and Film Festival/Cine Arte Film Festival—the only Latino Queer festival in the nation. Karla sees her creative work as the best tool for activism and her contribution to empowering her community. 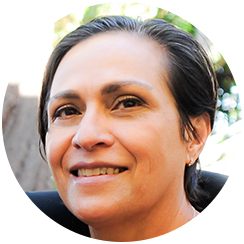 Adelina is an acclaimed and award winning two-spirit Xicana lesbian multi-genre artist, cultural activist, teaching artist, director and producer. She has over 20 years of performance experience and has garnered Best Actress nominations and awards. She most recently wrote the short film, "Get The Life," as part of Film Independent 2016 Project Involve team. She is the screenwriter of "You're Dead To Me," a 2014 Imagen Award winner, executive produced by LPB and Film Independent’s Project Involve. In 2014, she was the Film Independent Project Involve fellow selected to receive the Sony Pictures Diversity Fellowship Award. That same year she was also invited to participate in the 2014 Sundance Institute Screenwriters Intensive. This summer marks the world premiere of her debut feature film, "Bruising For Besos." 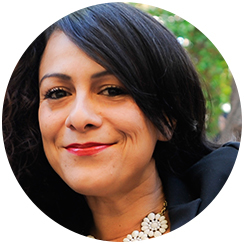 Along with Marisa Becerra, she is a managing member and co-founder of AdeRisa Productions, LLC. Marisa is a successful and independent business owner who has supported the arts in various capacities over the last 30 years; she is the co-founder of AdeRisa Productions, LLC, and is its Chief Financial Officer. This new independent production company is dedicated to producing and supporting works by emerging film talent from queer and trans people of color communities, with a special emphasis on X/Chicanas/Mexicana and Latina stories. In 2012, Becerra produced "Forgiving Heart," and later that year executive produced Ofelia Yánez’s debut short film, "The Good Kind." She is the lead producer for "Bruising For Besos," the company’s debut feature film. She is currently working with D’Locokid Productions as a producer on a new webisode series. Director Karla Legaspy navigates the relationship between young Iliana and her mother Terry, and Terry’s friendship with Chela through the story of “GoldStar.” The film explores a conversation on both love and discrimination that those in the LGBTQ community — of all ages — cope with to this day. Legaspy spoke with PBS to discuss the characters behind the film and the symbolism behind the gold star imagery. PBS: There’s a moment during Iliana’s talent show when the film cuts back and forth between a shocked audience (all adults) and Iliana’s friend who seems oblivious to what’s happening and is merely having fun. What were you attempting to reveal with this scene? KARLA LEGASPY: I was just showing how young folks are so detached from hate. I don’t think that kids that age are thinking of labels or passing judgment… we teach kids hate. So her little friend is just like “wow my friend is taking a chance,” “she’s singing her song.” She’s happy for Iliana; she’s loving and supporting her. The character of the little girl Xitlali is a character that I created to inspire other young folks to be that support system for any friend who’s going through any kind of transition in their life, whether that’s gender identity or sexual orientation, or having a hard time at home or in school. I think she’s a character that we can all learn from. PBS: The audience of this film can see Terry’s acceptance of her friend Chela at the beginning of the film despite the fact that she is gay. Yet when she realizes her own child is gay, she immediately rejects both this and her friend’s lifestyle. What did you want to show with this complete 180 and do you feel you’ve seen this in your everyday life? KARLA: I see that happening often in my community. There are folks who can love and accept LGBTQ folks but when it’s one of their family members or their own kids they sometimes freak out for various reasons. One is they fear for the life and safety of their loved one and second we don’t know what kind internalize homophobia they might be walking with. We don’t know folks’ hearts and how much oppressive learned behavior they’ve had to suppress. Terry is an activist and even in her role as an advocate she still has her own process of acceptance. On another note: We can’t assume that Iliana is gay. We could assume that she has tendencies and I think the lesson in that is to give young folks a chance to express themselves, no rush and no pressure. At the end of the day, all our youth really want from us adults is that we love them and provide them with safe spaces. PBS: The name of the film is “GoldStar” and this imagery exists throughout. What was the reason for this? KARLA: Gold star stickers in elementary school are a big deal! For Iliana the gold star stickers she collects from her teacher are moments that make her feel loved, validated and encourage. The backstory of the film is in the song. If you listen to the song, “a gold star from you to me I’ll give you my golden ring” the backstory is that Iliana gets a gold star sticker and it gives her the courage to gift her teacher a gold ring. This exchange inspires Iliana to sing in the talent show and proclaims her love publicly. PBS: The star of this film is young Iliana. However, there’s struggle between Terry and Chela as well. Do you feel like you had intended this to be for adults or for children (or both) and what message do you hope it sends to viewers? KARLA: This film is universal in that both adults and children will be able to identify with it. This film is intended to spark a conversation. Right now we see young kids start questioning their identity at a young age (more than before perhaps) there’s a role that we play both as adults and kids. As community members and adults how do we show up for our children? How do we advocate for them and trust their process and feelings. What are we doing to create those safe spaces? Young kids as well have a responsibility to show up for those that need that alliance. An important moment in this film is how the innocence of a little girl can have such hard and painful repercussions. It’s shows that homophobia and fear of those tendencies are something that even progressive parents can struggle with. Let me give you an example. I read an article sometime last year where a little girl asked her male nurse to marry her. Those articles and posts are common and can be really cute, and everyone praises the moment with “oh she’s so cute, oh adorable,” and they are sweet innocent moments. But when I run into those articles and know that if that little girl was proposing marriage to a female nurse, or cop or teacher there would be a completely different reaction. We still live in a hetero normative society. So I felt it was important to showcase a story that would hopefully raise these questions. It pains me that when it comes to a child who’s showing tendencies of gender nonconformity or LGBTQ tendencies that social we automatically attempt to stop the behavior. If we treated our LGBTQ youth with the same love, encouragement and normalize their behavior as we do with hetero youth what a beautiful and equal world we would live in. So it’s just a critique on how we are, and how there’s so much bias on what we choose to encourage and what we don’t. I hope this film starts many conversations and that young folks feel supported and loved.